For some reason, it has been hugely difficult to get excited about new or new-ish metal bands over the last few years. While my taste has become more and more polarized between the more extreme or technical metal and almost ambient music, more traditional metal tunes haven’t found their way to my playlists like before. During last year’s spring, however, a friend of mine had picked up the Austrian band, Harakiri for the Sky, from his Spotify Discover Weekly playlist, and it blew me away instantly – it was almost as if one was listening to a more black metal-ish Insomnium. I ended up buying both their vinyls twice and pre-ordering their third album, III: Trauma, released last fall, the second it became available. I even threw their name on some lists when festivals asked who the crowd would like to see in the summer. 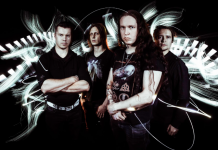 The pleas of myself and many others were answered when Tampere-based Nem Agency announced that Harakiri for the Sky would play at their SaariHelvetti festival in August. The anticipation went through the roof only to fall back down upon the announcement of the timetables, specifying a measly 30 minutes worth of showtime for HftS. Nem managed to turn the situation around with a second show the night before at Helsinki’s Elmun baari, marketing the event with an extra-long setlist compared to the SaariHelvetti set. Of course I eventually attended both shows, but let’s cover Friday night first. 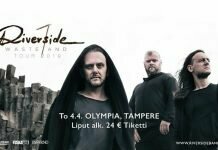 Considering my upcoming Tampere journey, the showtimes were pleasant, as HFTS was to begin at 22:00, and the Helsinki-Kotka-Hamina-Kouvola –based melodeath/thrash act, Evil Drive currently working on their sophomore album – was to warm up the stage at 21:00. I got in about 15 minutes before Evil Drive’s showtime, which eventually was delayed to 21:10 due to the pretty scarce audience. The band began their set with their latest single, ”Anti-Genocide”, and the attention was naturally focused on singer Viktoria Viren, delivering vocals that easily hold up against the ladies of Arch Enemy, for example. As the show progressed, Viren did her best to get the audience to participate, ending up being visibly frustrated as the fists only pumped for a short while at a time. During the show, I found it really difficult to get a hold of the band’s lasting theme, but then again, I can only blame myself for not listening to a single track beforehand. The function of the Indian headdress that Viren wore during ”Anti-Genocide” was left a bit blurry in that moment, but afterwards I looked the song up and found out that it’s about the history of America’s indigenous people. There was a Nazi [ed] Russian army cap on stage at some point, so I guess I should also check out the themes from their debut album. The stage that was set up in Nosturi’s lobby didn’t actually help Evil Drive’s music either, as the space isn’t meant for playing metal shows – the sound was brutal and really bare, badly mushing up Viren’s microphone at times. The spotlights were static as well. Still, the show wasn’t bad in any way – the Motörhead cover, “Killed by Death”, played near the end of the set (possibly on the fly), managed to finally activate the front-rowers, and the band played a couple of to-be-released tracks as well. Having been present at the show, Viren’s primary school -aged son in his large earmuffs served as a nice ending to the show by climbing on stage and shredding a few chords – wonder when his band’s first demo is coming out? And then we waited. On record, Harakiri for the Sky is a two-man band, being known only by their initials: M.S. plays all instruments, J.J. does the vocals. Considering that almost everyone present was certainly a fan of the band, the guys got to smoke their cigarettes on the bar’s terrace surprisingly uninterrupted. The band climbed on stage at about 22:15 with their intro tape playing the sound of rainfall. Things were expectantly kicked off with “Calling the Rain” from III: Trauma, yielding a good deal of accepting nods from the audience. J.J’s voice wasn’t quite on point from the start, but the situation improved as the 11 minute song went on, bringing the much-needed harshness to his bellowing voice. The man didn’t waste time on speeches, letting the band continue straight to the second album Aokigahara’s “69 Dead Birds for Utøya” and back to the new record with “Funeral Dreams.” The five-piece band played with great synchronization, and their bassist was especially interesting to watch, since he slapped away with his six-stringer without a pick. As the fifth song, HftS made a trip to their self-titled debut with “Dancing on Debris”, and later on, even “Lungs Filled with Water” was played. The set was concluded with the band’s The Best Song™, Aokigahara’s ”Jhator” – the song’s only fault is that the magnificent guitar lead in the end doesn’t go on for longer. As silently as they began, HftS also left the stage and there were no encores, but no one probably would’ve needed more; it was a great set! It’s always unsettling to attend a show from one of your favorite bands for the first time. Will they be as good live as on the records? Will the set include all the good songs? Though I could’ve swapped a couple of tracks from the new record for older ones, Harakiri for the Sky still fulfilled all of my expectations. J.J. clearly isn’t a showman, even appearing a bit shy on stage at times and refraining from making contact with the audience, but (post) black metal isn’t a genre you’d first associate sucking up with. If I’d have to find something to improve from the show, it would be the drummer’s habit of slowing things down for blastbeat passages – every time you tried to mosh away, you’d first have to find out on how much slower you’d need to do it. More practice, I’d say! Judging by next morning’s headache, I had chugged a good deal of beer during the event, making the decision to leave for Tampere by bus instead of by car a really welcome one; I probably couldn’t have made the trip if I’d had to drive myself. A big thank you to Nem Agency for this opportunity – let’s do this again real soon, please!